A high-speed car chase, spanning more than 100 miles and four counties, ended in a crash on northbound Interstate 280 in Los Altos Hills and the driver's arrest by the CHP. SOLANO COUNTY, Calif. -- A wild, high-speed car chase that stretched for more than 100 miles through the Bay Area Tuesday ended in a crash in the South Bay. The chase involved three freeways and four counties, starting near Fairfield in the North Bay. Then the SUV headed south on I-680 through the East Bay until reaching San Jose, and then headed back north on I-280 before crashing in Los Altos at around 3 p.m.
A high-speed car chase, spanning more than 70 miles and four counties, ended in a crash on northbound Interstate 280 in Los Altos Hills and the driver's arrest by the CHP. 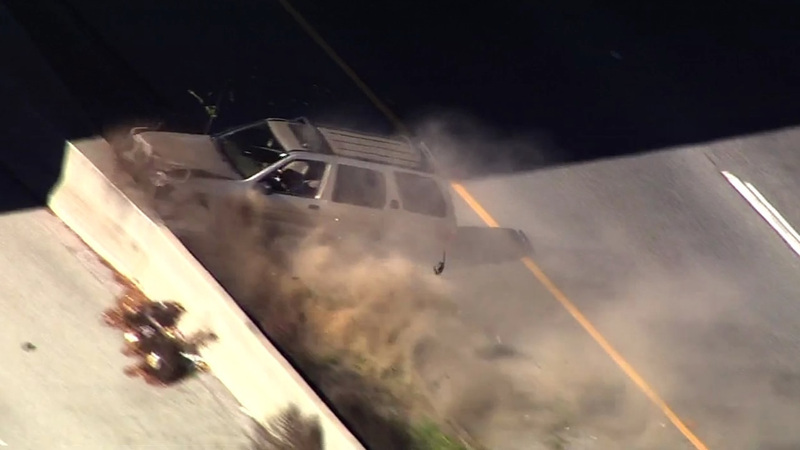 SKY7 HD was overhead as the driver's SUV reached speeds of 100 miles per hour through multiple North and East Bay cities along southbound Interstate 680. The CHP arrested a suspect on northbound I-280 in the Los Altos Hills following a high-speed chase that spanned more than 70 miles in the East Bay on March 17, 2015. California Highway Patrol officers said a man refused to stop when they tried to pull him over in Fairfield. The suspect kept driving even after his front left tire blew out. He continued driving on a steel rim at high speeds for several miles. That rim eventually broke apart and the Nissan Pathfinder suddenly overturned and flipped several times on northbound Interstate 280 in Los Altos Hills. No other cars were in the lanes near where the SUV overturned. Moments later, the driver emerged from the SUV and walked around the vehicle until CHP officers arrived. Officers drew their Tasers as they arrested him. The driver did not appear to be seriously injured, but was transported to a hospital as a precaution. The CHP said the driver is facing felony charges.